In the long run, the only sustainable competitive advantage is your organization's ability to learn faster than the competition. 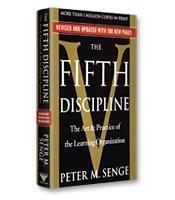 In The Fifth Discipline, Peter Senge describes how companies can rid themselves of the learning "disabilities" that threaten their productivity and success by adopting the strategies of learning organizations — ones in which new and expansive patterns of thinking are nurtured, collective aspiration is set free, and people are continually learning how to create results they truly desire. How to reignite the spark of genuine learning driven by people focused on what truly matters to them. Ways to bridge teamwork into macro-creativity. How to free yourself of confining assumptions and mindsets. How to determine if your organization has a "learning disability." What the 11 laws of the fifth discipline are. How to identify the patterns that control events.